Tension prevailed on Tibba Road when a team of MC officials, under the supervision of Kamaljit Kaur, assistant town planner, Zone B, went to demolish illegal sheds. 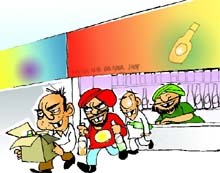 Liquor prices have seen a slash of another 5 to 10 per cent as the contract for liquor vends is expiring on March 31. After the allotment of the new vends, the prices crashed by 20 to 25 per cent. In a major breakthrough in yesterday's kidnapping case, the police has recovered the eight-year-old boy from the outskirts of the city today and arrested his maternal aunt in this connection. 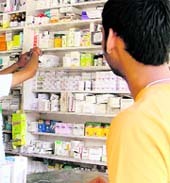 In blatant violation of the Drugs and Cosmetics Act, more than 90 per cent out of the total 3,300 retail drug stores and chemist shops in Ludhiana district are being run by "proxy pharmacists" on the basis of licenses issued in the names of qualified pharmacists. Keeping in view the rising prices of duplex board and craft paper, the Offset Printers Association has decided to increase the prices of cardboard and corrugated boxes by 20-25 per cent. With board examinations getting over tomorrow, many might think its playtime for students after months of hard work and toil. But, alas! There is no respite in sight for the students for another couple for months as a series of entrance exams are lined up which are essential to be cleared in order to get admissions in reputed institutes. 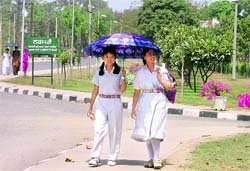 Charitable hospitals and NGOs have been playing excellent role in society. Hira Singh Gabria, Minister for Jails and Tourism expressed these views while addressing the gathering on the 37th Foundation Day at Nihal Singh Pahwa Charitable Hospital here today. The flying squad today conducted raids at more than 10 schools. A student was found copying during the exam at Spring Dew School, Jagraon. Supervisor of the school Munir Ahmed was relieved from his services. The eagerly-awaited fashion exhibition “The Woman-2010” will begin from April 2. The event, which will conclude on April 4, will showcase an exclusive range of recent fashion apparel, diamond jewellery, fashion watches and fashion home décor. Jesus Sacred Heart School, South City, held its annual function and prize distribution on the school campus yesterday. Dhillon was the chief guest, while Davinder Singh (ADC) was the guest of honour. Hanuman Jayanti is being considered more auspicious this time, as it fell on Tuesday, the day which is dedicated to Lord Hanuman. 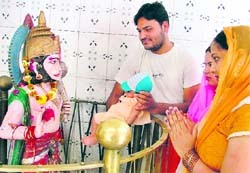 Devotees thronged Hanuman temples to offer their prayers. The festival commemorates the birth anniversary of Lord Hanuman during the month of “Chaitra” on a full moon day. The past week saw some of the leading models of the fashion world from Mumbai and Delhi sashaying down the ramp at the newly opened Kapsons Mega Fashion Store at Ansals Plaza of the city. A major tragedy was averted when a Hyundai Accent car caught fire at Jagraon Bridge here this afternoon. 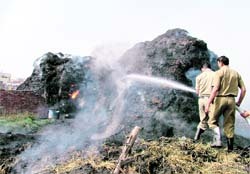 While no loss of life was reported in the incident, the car was charred. With intent to paying tributes to his mother tongue and enabling the Punjabis conceive and adopt teachings of Lord Krishna in their partical life, Giani Ram Sarup Sharma, an NRI from nearby Akhara village, has made available the Bhagwad Gita in Punjabi language. Ludhiana Sanskritik Samagam has always endeavoured to bring a cultural change in social fabrics of Ludhiana. Keeping the tradition alive, the samagam in association with the Prabhuji Production Group will organise a Mega Dancing Star Show on April 3 at Guru Nanak Dev Bhawan here. District Family Welfare Officer (DWFO) Dr Reena Sandhu along with Dr Sumita Sehdev, Dr Navneet Singh during a surprise check conducted on six ultrasound scan centres in the city, suspended the registration of the scan centre at Arora Nursing, Samrala Road, yesterday. Normal working in the offices of the Punjab State Electricity Board (PSEB) today came to a complete halt as clerical and technical employees went on a day-long strike to protest against the policies of privatisation and to press other demands, including removal of anomalies in the report of the Wage Formulation Committee. The call for strike was given by the PSEB Employees Federation (AITUC). Ram Pal, a resident of Rajiv Gandhi Colony, Focal Point, succumbed to his injuries sustained during a minor altercation with his neighbour, Pradeep, last night. Both Ram Pal and Pradeep were reportedly drunk and had a fight over a trivial issue. According to information, Pradeep thrashed Ram Pal and his son Mintu Kumar. Ram Pal sustained serious injuries and was admitted to a hospital. Justice Ashutosh Mohunta of the Punjab and Haryana High Court, who is also the administrative judge of the Ludhiana Sessions Division, has given a clean chit to the ex-bar council chairman of Punjab and Haryana, practising in Ludhiana. The prize distribution function of the employees’ sports meet of Dayanand Medical College and Hospital and Hero DMC Heart Institute was held here yesterday. The meet was held between March 17 and March 27, in which a large number of participants competed. DMCH principal, Dr Daljit Singh gave away the prizes to the winners. A student of the GTB Institute of Management and Technology here bought laurel for the college by his outstanding performance in the sports. Harjinder Singh of BCA won a bronze medal in high jump in the 13 th Punjab Technical University Athletics meet held recently at SBBSIET, Khiala (Padhiana).